The Paleofuture blog turns 7 years old today! And you can now find every Paleofuture post ever written—right here at Gizmodo. When I came on board at Gizmodo this past May, I brought my entire Paleofuture archive with me. Every post I've ever written under the Paleofuture name—at Paleofuture.com and Smithsonian—can now be found here at Paleofuture dot Gizmodo dot com. All you need to do is use that little search bar in the upper lefthand corner. For instance, if you're interested in Nikola Tesla's predictions for the future, just type in "Tesla." Interested in robots or monorails or Disney? Same deal. Paleofuture explores how people of the past imagined the future, and we're always making more futurism. So conceivably I could do this forever. But we'll see about that. We're seven years in and (amazingly) I'm not sick of the topic yet. 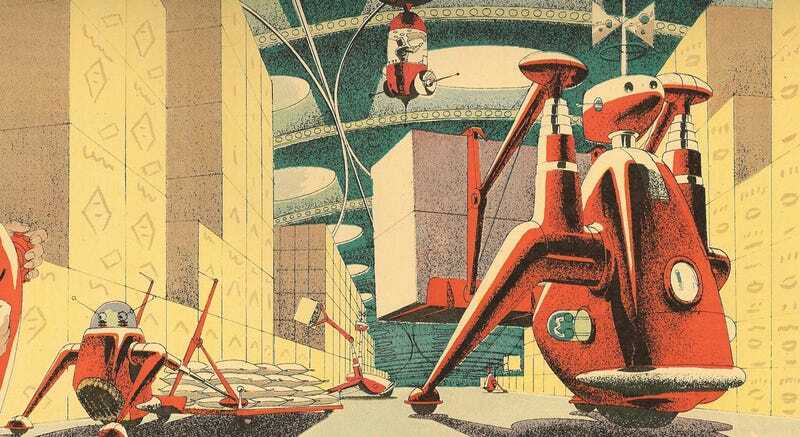 I really do think that futurism provides the most fascinating lens through which to study history—from the shiny plastic utopias of the 1950s to the dark polluted dystopias of the 1970s. And as I've said before, looking at the accuracy of past predictions is really just a jumping off point. Determining if an old prediction was "right" is fun, but the truly interesting question is why people made their particular prediction to begin with. What was the context of the prediction? What were people excited or terrified about? As always, predictions say more about the person making them than they do about the actual future. So here's to seven more years of our weird and wonderful visions of yestermorrow, and definitely drop me a line (novak@gizmodo.com) if you find something paleofuture-y that I haven't covered. Image: Scanned from the April 27, 1958 edition of Arthur Radebaugh's Sunday comic strip "Closer Than We Think"